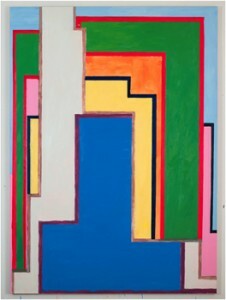 THORNTON WILLIS: STRUCTURAL ABSTRACTION features abstract oil paintings that represent art work spanning a decade: lattice paintings, triangle paintings and his latest work. What his art works have in common is the “allover surface plane held in tension, between figure and ground, as an interwoven field,” writes Lance Esplund, arts contributor to the Wall Street Journal. 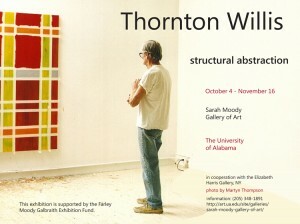 ALUMNI YEARS — Thornton Willis earned his MA in art in 1966 (equivalent to today’s MFA) from the University of Alabama’s department of art and art history, where he came to study under the renowned abstract expressionist, Melville Price. 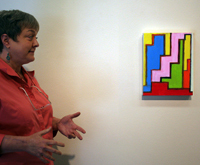 AWARDS — Thornton Willis’s awards include a painting fellowship from the Guggenheim Memorial Foundation, painting and printmaking fellowships from the National Endowment for the Arts, the Adolph and Esther Gottlieb Fellowship, the Pollack-Krasner Foundation Painting Fellowship. Willis was awarded membership in the Southern Mississippi College of Arts and Letters Wall of Fame, his undergraduate alma mater. 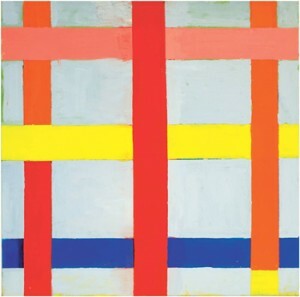 He has art work in more than forty collections, including the Museum of Modern Art; the Solomon R. Guggenheim Museum; the Whitney Museum of American Art; the Albright-Knox Art Gallery in Buffalo; the Phillips Collection in Washington, DC; the Herb and Dorothy Vogel Collection in the National Gallery, Washington, DC; the High Museum of Art, Atlanta; the Arkansas Art Center, Little Rock; the New Orleans Museum of Art; the Denver Museum of Fine Art; and the Portland (OR) Art Museum.